Hey Corgi people! It’s that time of year again to get in the spirit of gift giving. 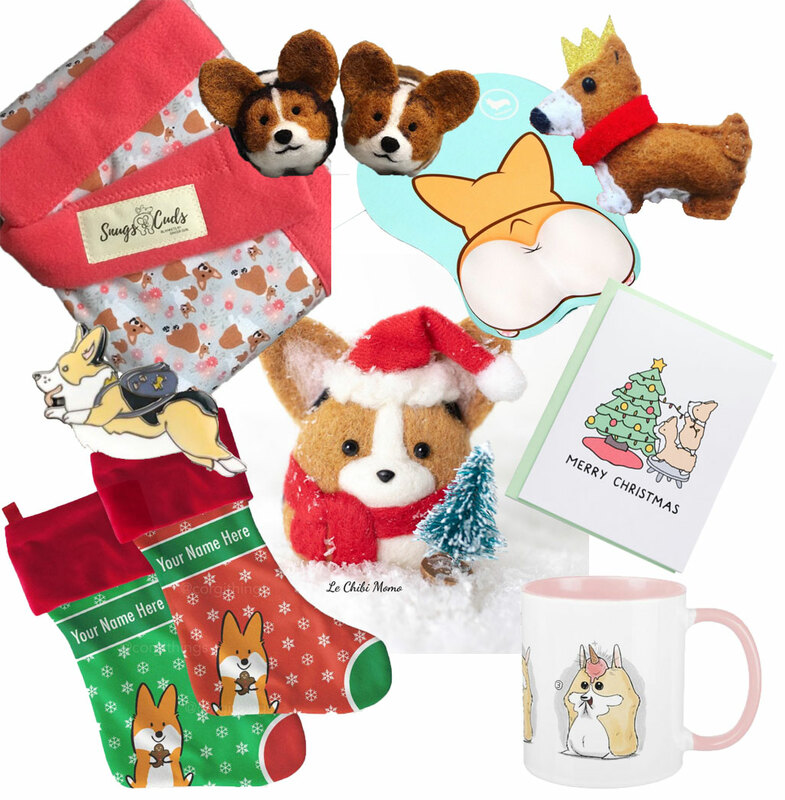 This year, our post focuses on Corgi-themed products, made by small businesses in small batches. We’re really excited because this gives us a chance to feature artisans who make things by hand or entrepreneurs who just love to put out Corgi gift products! Known for its comic book look and sense of humor, Corgli is one of our favorites! It’s a blob of Corg, and loves to pose in his fame! Created by Tiffany Wu, Tiffbits is the delicate cutie in the game. Specializing in very cute greeting cards, this collection is absolutely what you expect from a thoughtful artist with attention to detail. Do you love watercolour art? And love enamel pins? Easy Sunday Club is for you. Cathy Zhang is a super sweet person with a beautiful hand in flowing animal artistry. In addition to Corgis, she creates images of giraffes, elephants and more. How about getting a beautiful blanket WHILE donating to pet cancer care? Then Snugs & Cuds is right for you. Based upon their experience with Ginger and cancer treatment, this couple decided to provide comfy blankets for others at the Veterinary Cancer Group. This lead to the great idea for a blanket biz! Hand sewn felt brooches of…guess..Corgis, but more! Doxies, beer bottles, bats, etc. All the way out of the UK, Cherrybean Crafts is a simple concept with very big personality. Love the Bowie cats so much! The art of felting…so cool, so cute and SO HARD. We know. We’ve tried with massive failure. So our respect and appreciation for Fiber Friends is immense!!! Each product is hancrafted, with fine detail to fur color and personality, closely matching your Corgi. What a great idea for a friend who has everything! If you want to browse a ton of Corgi stuff, check out Nayo the Corgi. You can find mugs, mousepads, backpacks, jewelry, whatever! You name it, they most likely will have it! Stocking stuffers galore!!! If you love handcrafted, have you seen the art of kongiri? The japanese version of needle felting? Le Chibi Momo are cute little rice ball Corgis, tightly knitted in very adorable holiday-themed outfits. And, in snow globes, too! So kawaii and the perfect Corgi gift!!! With Corgis becoming more and more popular, expect to see more types of Corgi gift ideas from local artisans. I think it’s pretty cool that the craft community is coming out and applying their skills and entrepreneurship for all of us to enjoy! Here’s to the success of all of these furiends! And don’t forget, it wouldn’t 2019 without plugging our Corgi calendar! SHOP for one here!